Have you wanted to invest in stocks but feel that you don’t have enough to get started? That is how I used to feel when my wife and I started out investing. We almost always let our cash build up to $1,000 before we thought of purchasing any new stock. Our online broker at the time charged $7.95 per trade … so investing $100 or less was out of the question. For the investor just starting out today however, the investment landscape has changed. It is possible to invest $100 or less in the stock market … without having to worry about commissions or fees. If you are just starting out investing and don’t have a lot of cash, these two tools can help. LOYAL3 offers zero commission trades on a select number of stocks, including some great dividend paying companies. You can invest as little as $10 in partial shares of stock. It doesn’t get much easier than that! We currently hold 10 dividend stocks in our LOYAL3 account, which makes up approximately 28% of our portfolio. Robinhood also offers zero commission trades on U.S. stocks. With Robinhood, you must purchase at least 1 share of stock (no partial shares). However, their selection of stocks you can invest in is much larger than LOYAL3. We currently hold 8 dividend stocks in our Robinhood account, which makes up approximately 27% or our portfolio. Either way, you really can’t go wrong if you are just starting out with one of these two brokers. Investing small amounts of money in stocks has never been so easy. Provided you are eligible for a Robinhood and/or LOYAL3 account, you can start investing small chunks of money. The great thing about both brokers is that they offer commission free trades. So you don’t have to worry about that $10 commission (or whatever others charge) on such a small amount of money. I know that when I first started out (before Robinhood or LOYAL3), I would have never thought of investing just $100 in stocks. The $7.95 commission per trade would have made that scenario a waste. Both tools have a few limitations, but overall you can take advantage of zero commissions! 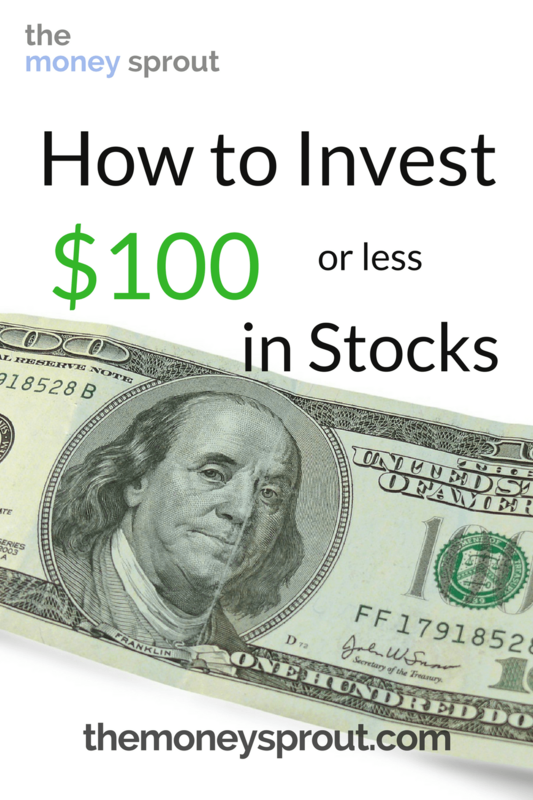 Still not convinced you can start investing $100 or less in stocks? Let me take the opportunity to show you what an investment of under $100 could look like. Below, you will find an example of an investment we made earlier this week for $72.08. The majority of new investments we make are done so through our LOYAL3 and Robinhood accounts. Both offer zero commission trades making it easy to invest. This past week, our Robinhood account received $44.68 in dividends from two of the stocks we own in the Money Sprout Index – OHI and O. We also had a little over $40 in cash balance leftover from past deposits. So with $80+ sitting idle in our account, I wanted to put that money back to work for us. We don’t let money sit for too long in our accounts. If the money is just sitting, then it is not out generating additional income. We bought 1 share of Aflac (AFL) stock for $72.08. With a yield on cost of 2.38%, we increased our annual dividend income by $1.72. Nothing earth shattering. But the majority of the money used to buy that share of stock was from past dividends. I can’t stress enough the importance of recycling your income. In the case of dividend stocks, it means reinvesting your earnings back into new shares of stock. Whether it be from DRiP (which isn’t always your best option) or saving up to buy 1 share of stock – you need to keep the money moving. Reinvesting is one of the 3 ways you can make your dividend income grow. And while that growth may be slow at first … it will one day start to take off. There are no excuses about not having enough money to invest. For as little as $10, you can invest in stocks and take the first step in putting your money to work for you. Zero commission brokers like Robinhood and LOYAL3 make this scenario possible for investors with a small amount of capital to invest. My wife and I have been investing in dividend stocks for almost 10 years now. And we still take advantage of investing small amounts of money ($72.08) into the stock market. We want to put our money to work as soon as possible earning more income … and so should you! What is the smallest amount of money that you have used to purchase stock? Have you purchased a stock yet through Robinhood or LOYAL3?